Oana’s over 15 years of experience in Software Development and System Management led her choice to Agile, as the most effective approach for 21st century leading organizations focused on quality products creation that matter. She recently embraced the entrepreneurship path by founding cOemerge a company that helps its clients embrace Agility and build product that matters through Lean Startup. Oana acts as Agile Transformation facilitator, using Creative Solution Definition, and train and coach Agile teams (from core Business to Software development and support services) to adopt the most adapted set of practices, from Scrum to Kanban and Lean improvement techniques. A key focus is supporting organizations to acquire Product Ownership driven by User Value and align teams (exploring User Experience) mission to enterprise mission. In her former position as Program Director, Oana helped teams build an Agile Program portfolio become Agile. Oana also participates actively in Agile French and International Community, as she strongly believes that connected knowledge is a value generator. 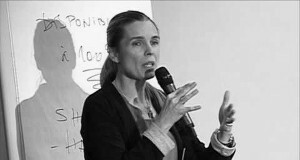 She is a frequent speaker in different Agile French and International conferences and help reinforce collaboration in the Agile and Lean community by being present as an ALE2011 Member of the Organization Team – Programme Sofa & Vision Sofa, a member of the Agile Tour Board since 2009. She’s also an Innovation@Games Trained Facilitator since 2009 and developed an original approach to define products in a Lean Startup way, called Test Driven Business.